Notice: All photos produced by us are not public domain. They are ours and hold our copyright under international copyright law that protects original works, both published and unpublished. If our photos are found by us or by any informant to be used for sales or gains on any website or online auction, it will be reported to our state's FBI office of internet crimes and fraud. - a breeding program to re-make the breed. Please note that we do not have Onagadori. There are no known pure Onagadori in the US at this time. The birds we have are descendants, not pures, that we are working to rebuild into Onagadori. Therefore, not "Onagadori", just non-molting long-tails that can potentially be developed into Onagadori with lots of work and refinement. For a bird to be classified as an Onagadori the saddles and coverts must remain growing for at least 3 to 4 years consecutively. The saddle feathers also must be at least 1/3 the length of the longest coverts. For a better understanding of the traits pure Onagadori must exhibit, see the complete translation of the Japanese standard. These fowl will not thrive under typical poultry management! Shown at right is Hakuro. Having been testing a while longer than his brother, Hakuraikou, Hakuro has now grown to a length of 8' 2". He began growing at a rate of approximately 4"per month. His growth rate has increased over the past few months and is now growing at a rate of 5" per month. It's hoped that this rate will continue a while longer. It's normal for the growth rates to fluctuate according to seasonal and environmental factors. Left: Hakuraikou at two years and 11 months of age. 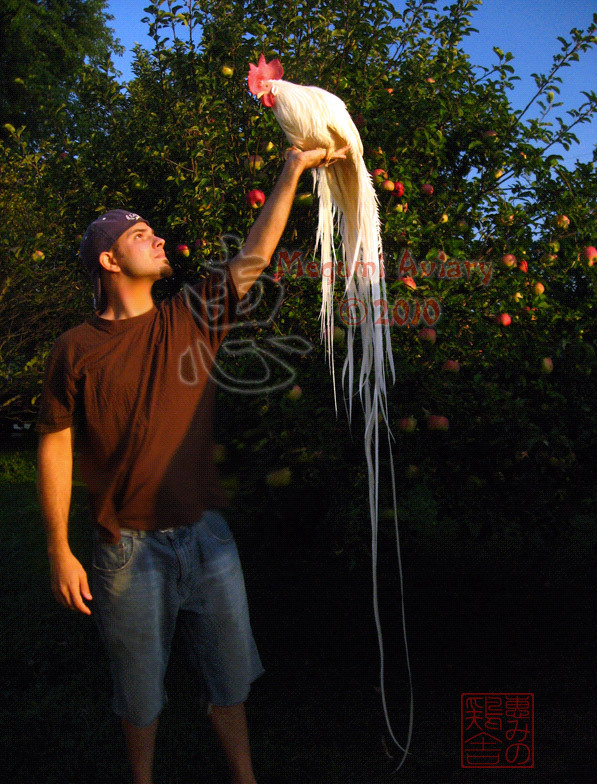 His longest tail feathers are 6' 6.75" and 6' 9". The adult feathers grew in two stages. He grew some during year one and others during year two. 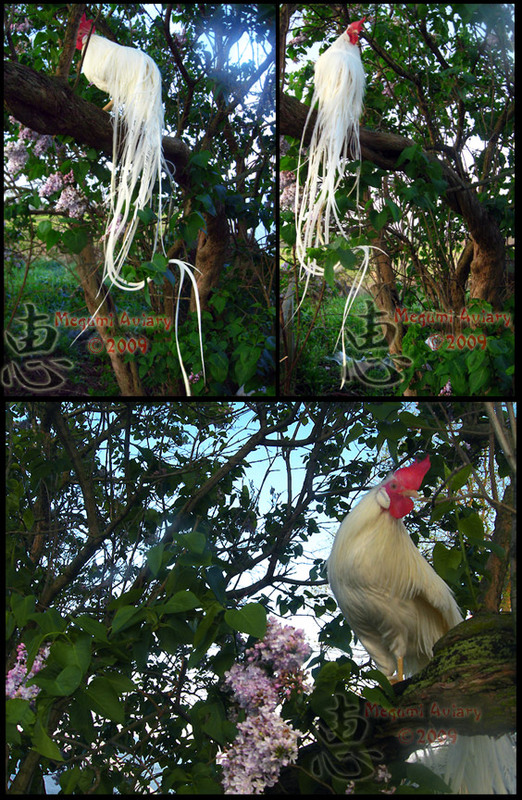 The longest feathers were grown in during year one and are one year ahead of the others. Usually, in cases such as this the adult feathers from year one would have been pulled out during the acquisition of the rest of the adult plumage during year two. 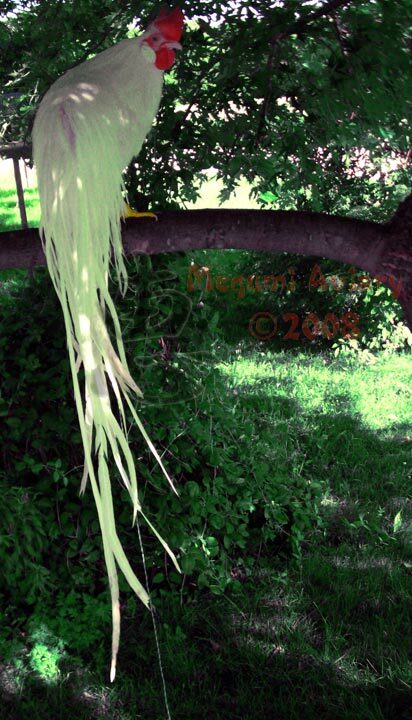 Doing that would ensure that all feathers reach roughly the same length at the same time. This is Hakuraikou at 20 months of age. His saddles are still growing and are shown here at 27.25" in length. 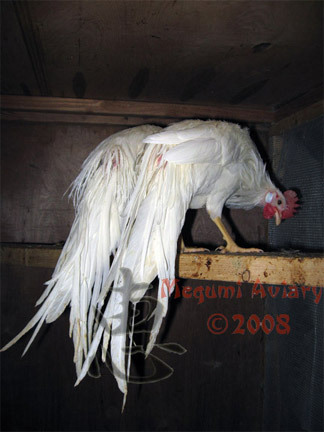 His tail length is still 4Ft due to the longest pair of feathers still being juvenile feathers that have stopped growing, but have not yet been molted out. 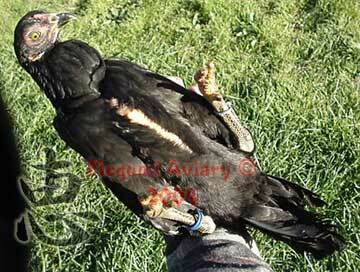 The rest of the tail is re-growing as adult plumage and quickly catching up to the juvenile feathers in length. It is hoped that his tail and saddle feathers will remain growing for three more years. During which time, his future mates will be produced for him. Hakuraikou, at 14 months of age, possessed 18 inch saddle feathers. These fall within the measurement of 1/3 to 1/2 the length of the coverts as per the Japanese ideal with the current length of the coverts. The final lengths of 4 foot saddle feathers and 12 foot coverts before first molt of the adult plumage would be the absolute ideal. Only time will tell if he will or will not meet those lengths. These saddle feathers first started growing at 2 months of age and at a year later most still continue to grow. Many of the coverts in the 14 month photos are missing due to the gradual switch over to adult plumage in that region of the feathering. This is Hakuraikou at 1 year of age. His coverts and saddle featheres remain in blood-feather. Hakuraikou out for a walk on jess and leash at 1 year of age. Hakuraikou at 9 months of age. Hakuraikou at 10 months of age, still in blood-feather. 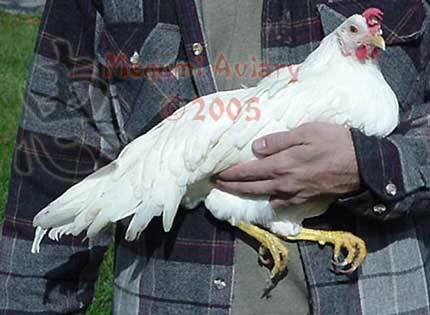 Yellow-legged recessive white cockerels at 4.5 months of age, 2.5 Lbs. 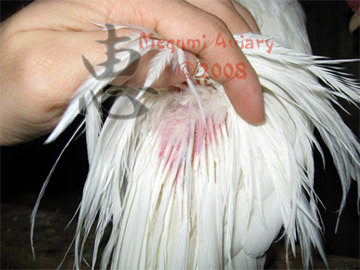 Blood-Feathers: Lightly pigmented birds such as this recessive white male clearly show the rich blood supply that fills the quills of feathers in the tail. Below, left: A 9 month old female offspring. The photo does not show the extent of multiple feathering that she has. Weight: 2 lbs 14 oz. 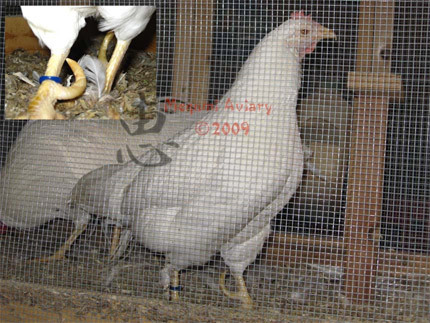 Below, right: Same hen photographed in 2009, at a mature weight of 3 Lbs, having some hefty looking spurs too. Below: The sister to the two birds above. She is six months of age in this photo. Looks pretty much the same at 9 months. Her tail actually appears short due to the length and profusion of the coverts and saddles. Her tail actually starts just in front of the ends of the wings. Pictured above are offspring from the yellow-legged recessive white line that we acquired. Some of the combs lop, but that really seems to be their only bad point so far. More long-rage rearing will tell more on resistance, but so far so good. They have remarkable flight characteristics. The offspring acquire total controlled flight at only three weeks of age. Slow motion playback of recorded flight reveals that the wings move in the horizontal figure eight with the tips going out beyond the head on the downward stroke as typical of other flighted birds. Not a typical chicken thing at all. 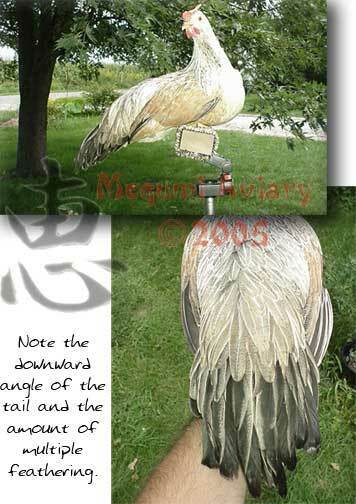 The multiple feathering and tail angle is like nothing else. The body feathers are fine and lacy around the edges. Very wispy and soft. 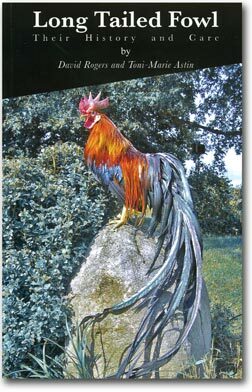 Left: Long Tailed Fowl, the new book by David Rogers and Toni-Marie Astin. Buy Now Available for shipment worldwide. Our goal is to breed up true modern Onagadori. Selecting very carefully for health and feathering, making as many family lines as possible so that inbreeding will never be required, are the most fundamental things at this point. 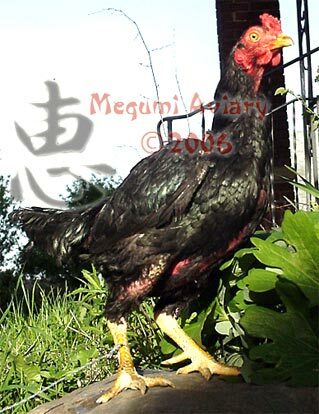 Coloration and comb size can all be fixed after the main points of the breed are set. 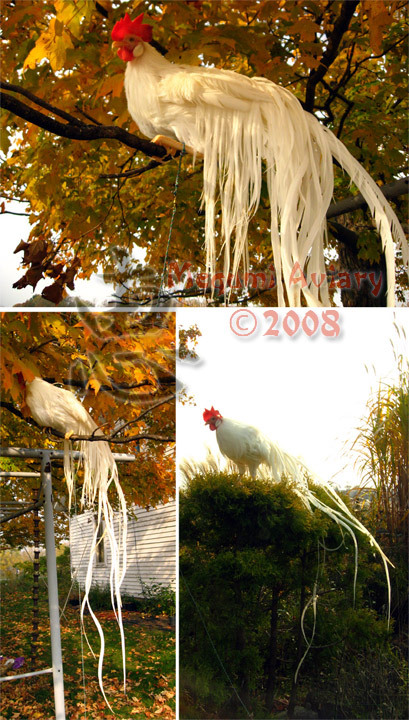 We are in frequent communication with Japanese Onagadori breeders. They are quite helpful and very polite people. We have great respect for them. It is their, and our, desire that this breed be preserved. Not any just one breeder can do this on their own. It truly takes a group effort of swapping information on what we all know and understand about the breed and sharing our experiences with it. Also, we are networking with various breeders within the US who also use Japanese rearing methods to share info and swap family lines. 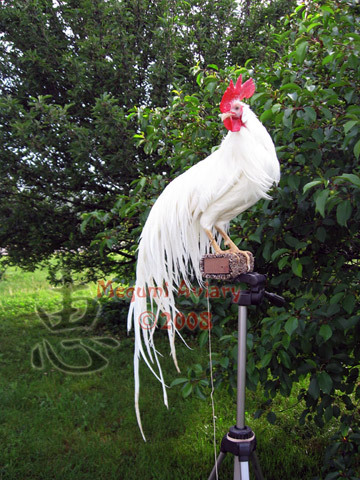 This is a message forum focussing around long-tail and long-crowing fowl. To view the complete Japanese standard click here. At left is Viper, our pure male Tuzo from Toni-Marie Astin. Quite a fine specimen. 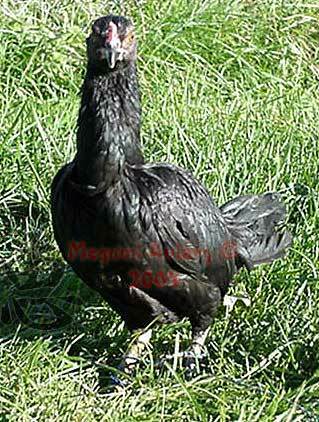 A great example of the breed aside from the light leg color; which is easy to fix. Toni-Marie had been working to improve leg pigmentation as well before we were chosen to take on the breeding program. Viper has much better upright posture than is pictured here. He just wasn't quite sure what to think about being outside. 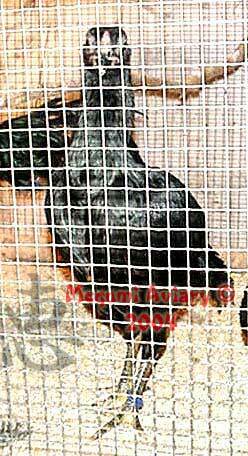 Tuzo are a bantam shamoid. 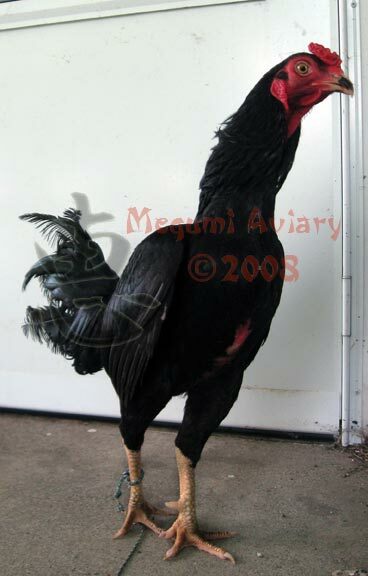 Said to have been developed in Europe and America from the Japanese Nankin Shamo and similar breeds. As such, they are known for their tenacious fighting style when used as pit game. However, we have worked against this habbit and are breeding for show stock, not fighters. 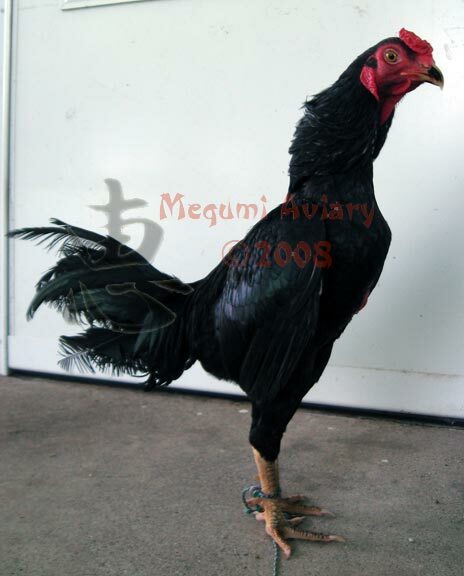 The temperment has come a long way and Viper does not mind the company of other roosters. Below are photos of his daughter from 2004. She and her sister are still being used in the breeding program. We worked on the Tuzo breedings this yr too, but don't have pics yet. Below are pics from '04. Our Tuzo were also improved. Both sexes of our original trio have yellow legs. We were especially pleased to have this hen pop up from the breedings. Weight was an issue in the previous generation. This little hen is right on target at 35 oz. Notice the darker legs in the indoor photo where the light isn't glaring so much. 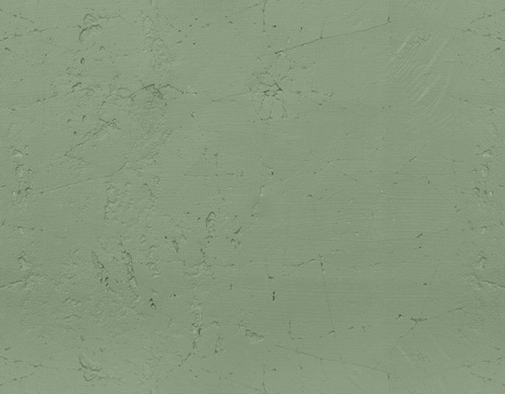 Another area in which she is an improvement over her parents and siblings is her bald patches on the tops of the wings and down the keel. She should produce some very good sons. We are looking forward to breeding her to a new male in '06.